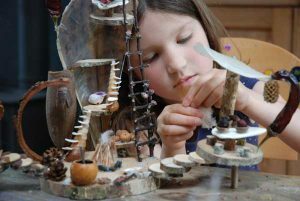 Naturemake workshops offer a range of fun magical making experiences throughout the year at various venues across South Devon. Join us to create dream fairy houses, tree top adventure camps or exciting seasonal sculptures. Our array of interesting natural materials and carefully foraged beautiful treasures bring out the artist in everyone. Our sessions offer a relaxed and un-prescribed environment where the participants have creative freedom to let their imagination take charge. All workshops are led by artists to help out with gentle guidance or to get you started. We also encourage adults to take part in the workshops together or alongside their children as we notice they get as much out of the experience as their children. Book onto one of our special workshops and take home a little bit of nature magic. Please sign up for news and updates so we can keep you posted! Prices vary depending on the event so please see above for upcoming dates and prices. Yourselves and a snack, each participant will given a box full of materials relevant to the workshop theme and use of a glue gun. Our workshops are normally 2 or 3 hours long. Please see our events page for exact times and durations. What age group are workshops suitable for? What if I need cancel? Unfortunately we are unable to offer refunds but will be happy to change your booking to an alternative date providing at least 48 hours notice is given. Please contact us if you have any other queries not specified above. On Sunday 25th of May I went to one of Naomi’s workshop: “Magical dwellings” which is a fantastic and inspiring workshop, based on completely natural little things that you put together creating a lovely and unique fairy house. During that workshop, another girl was there too and even if we had the same amount of things, our result was completely different and creative in different ways. Doing it was as exciting as relaxing at the same time. I found it extremely helpful, as I was building my fairy house, for my creativity to come out. I think this workshop (as the others) is not just for children – they can be inspiring and a real fun for adults too ! My daughter Alexi and I were delighted to receive a fantastical materials box as a present for her fifth birthday. Alexi tore open the lid and let her imagination run wild. She made up the design and I helped her with the glue gun. The many small, carefully thought out natural materials in the box set enabled us to create a truly magical home for any fairy. Alexi loves her fairy house and is always asking if we can make another, She keeps it on a shelf at the end of her bed so that the fairies can play there as she sleeps.